Surrounded by fashionably decorated flowers and butterflies, Hello Kitty in her Kimono greets you and invites you onboard the Haruka train. Operated by JR West, the new JR Kitty train service will connect visitors to Japan between Kansai Airport (KIX), Osaka and Kyoto. 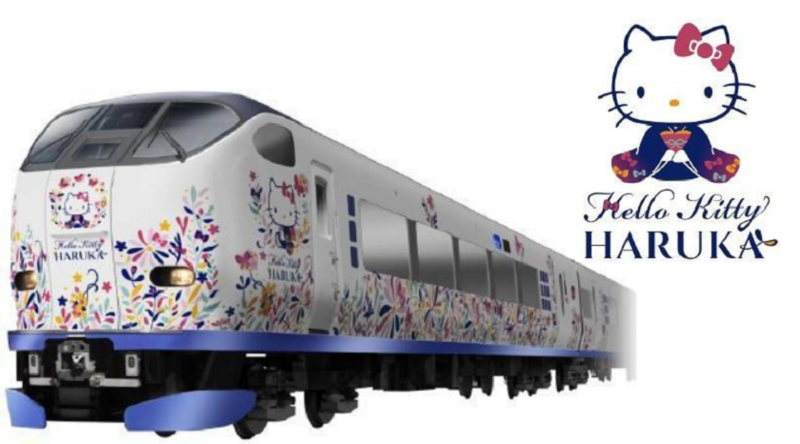 A special Hello Kitty Themed Haruka Express will start service from the 29th of February 2019, there’s a good chance you can get on right away when you arrive in Japan. The Hello Kitty Haruka Express operated as a normal Haruka Express service and is, free and covered by the Japan Rail Pass. Seat reservations can be made in advance using the JR Pass or any of the regional JR West passes. The interior will feature special Hello Kitty themed decorations bringing cute and chic together, motifs of natural flora and fauna referencing to Japanese tradition will emerge you in the world of Hello Kitty. On special days there’s a chance that you can meet Kitty-chan in her Japanese Kimono for a meet and greet, how amazing is that? The exterior of the train will feature Hello Kitty prominently, so there will be ample opportunity to take great pictures, don’t forget to share your pictures of Instagram with us! Q: Are there 1st class seats on the Hello Kitty Haruka? A: The Haruka Express has 1st Class (Green Car) seats available for those with a Green Class JR Pass. Q: Will the Hello Kitty Haruka replace the Hello Kitty Shinkansen? The Hello Kitty Shinkansen will remain in service but may be retired later in 2019, as of publishing this article, both are available. Q: Can the JR Pass be used on the Hello Kitty Haruka express train? Q: Can JR West passes be used on the Hello Kitty Haruka? A: Yes, as long as your JR West regional Pass covers the normal Haruka Express.